Drivers and other travellers are facing difficult journeys as icy conditions persist across much of the UK. The Met Office has a yellow warning for ice until Wednesday 11:00 GMT, with the worst affected areas likely to be Scotland and the north of England. A "flash freeze" caused disruption at Glasgow Airport, with some flights cancelled or diverted to other Scottish airports after the runway froze. Hundreds of schools were closed for a second day. Temperatures in central and southern England remained only a few degrees above freezing throughout Tuesday. The Met Office's warning covers Wales, parts of Scotland and much of England - including the Midlands, Yorkshire and Humber, London, the South East, East, South West, the North East and North West. It said the chance of ice was highest across parts of Scotland and northern England where rain might fall onto frozen surfaces. Those areas were also likely to see a few centimetres of fresh snow on high ground. "There will probably be icy stretches on untreated roads, pavements and cycle paths with some injuries possible from slips and falls," the Met Office added. At Glasgow Airport sub-zero temperatures and heavy rain caused a rapid formation of ice on the runway and taxiways as well as roads around the airport. Operations were suspended at Glasgow for 45 minutes. It is back in operation but travellers are being advised to contact their airline before leaving for the airport. 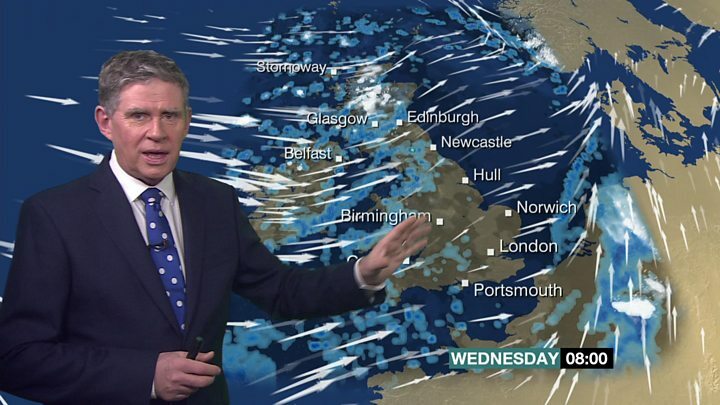 Travel may be disrupted over coming days as rain meets freezing temperatures and turns to ice on roads and pavements, said BBC Weather's Darren Bett. There remains a risk of snow in Scotland overnight on Tuesday, with a risk of light showers over high ground in northern England. Winds will strengthen over the course of Wednesday and Thursday, but temperatures will be higher than in recent days. Edmund King, AA president, said the service had rescued more than 140 people from snow and ice by lunchtime. He urged other drivers to slow down and leave more space between vehicles, and warned that opportunist thieves were stealing cars left defrosting on driveways and by the roadside. "Give yourself extra time and don't leave the car running unattended to warm up," he advised. More than 350 schools in the West Midlands, some 200 in Shropshire and more than 300 schools in Wales remained shut for a second day. On Monday, more than 1,000 schools were closed - about 600 of which were in Wales. An estimated 190 homes were still without a power supply supply in the West Midlands on Tuesday evening. Heathrow Airport in west London said the "majority" of departures and arrivals would run as scheduled but advised passengers to check before travelling because of bad weather in Europe. Train travellers faced delays on their homeward journeys, with Great Western Railway, Greater Anglia and London Northwestern Railway all reporting major delays into the evening rush hour. Some Arriva Trains Wales lines were not running on Tuesday evening and the company expects delays to last until the early hours of Wednesday. Eurotunnel also said services were running with delays, with four-hour waits for passengers departing from Calais and Folkestone. It recommended customers cancelled or changed their travel plans. P&O ferries across the Channel are delayed by up to three hours because of the weather. Travellers are being told to check in and will be put on the first available sailing. The TUC called on employers not to force staff to make dangerous journeys "for the sake of presenteeism" and to give staff advice on what to do if the weather or lack of public transport kept them away.